Yesterday Pew announced they were changing their generational definitions to distinguish between where Millennials end and Post-Millennials begin, that name is still a work in progress. Specifically, Pew now defines Millennials as those born between 1981 and 1996, which makes them the same size, at least in terms of the number of years, as Gen X (1965-1980). Previously the definition for Millennials varied but was generally early 1980s through late 1990s. Our office had used 1981-2000. In their work, Pew highlights some of the defining features or life experiences for Millennials, including 9/11, the Afghanistan and Iraq wars, the 2008 election, and coming of age during the Great Recession and its lasting scars on housing, employment, and the like. Post-Millennials on the other hand were too young or not even born during these major events. However the one defining feature I latched on to for Post-Millennials was the smartphone. By the time every Post-Millennial reached middle school, smartphones were ubiquitous. In the big picture these generational distinctions are not a big deal, given that societal and demographic changes are ever-evolving and slow-moving. Rarely is there a clear cutoff. That said, our office is updating our definitions as well in order to provide a more accurate comparison between state and national trends. 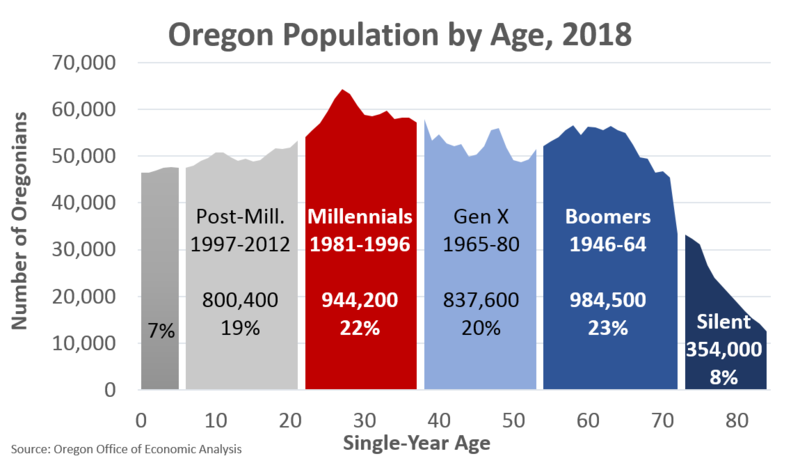 This edition of the Graph of Week takes a look at the Oregon population forecast by these updated generations, coming from the state demographer, Kanhaiya Vaidya, in our office. There’s a lot going on here, but the trends are clear. The reign of the Millennials has been pushed back to 2020 given the new, smaller generational definition, but they will still surpass the Baby Boomers. Pew estimates this will occur nationally in 2019. Not only are the younger generations still growing, in large due to migration, but we’ve hit the point where natural attrition is beginning to impact the Boomers. Oregon is still seeing net in-migration among Boomers, it’s just the increases in mortality are larger. As mentioned previously, the growth seen in the Millennials, the Post-Millennials, and at the end of the forecast Gen AA* (or whatever they will be called) is all about migration. Oregon’s ability to attract young, working-age households is vital for our long-run economic growth. 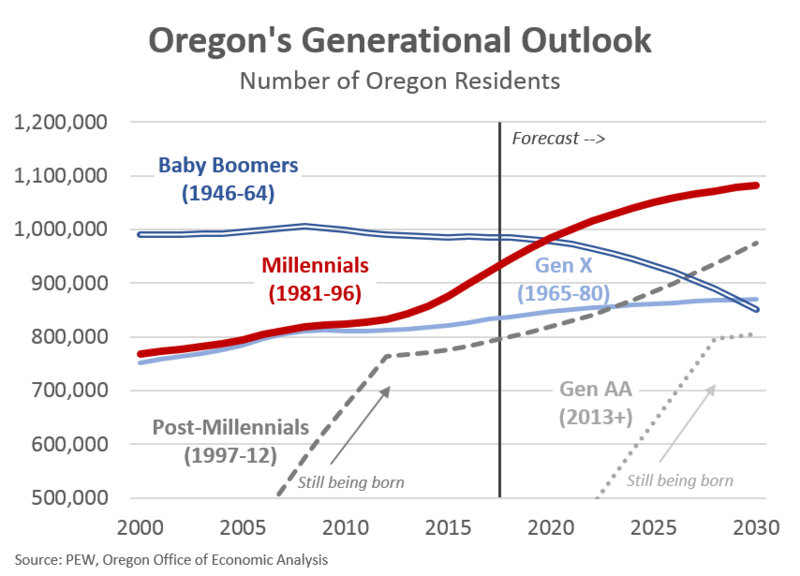 This is apparent throughout Oregon’s history — for example the Baby Boomers moved to Oregon in droves in the 1970s and again in the 1990s — and is built into our office’s baseline forecast. * Given both Gen X and the Millennials now span 16 years, I pegged the Post-Millennials at 16 years as well. The generation that follows has no name that I’m aware of. I toyed with calling them The Last Gen, but figured that was too apocalyptic. I’m going with Gen AA given Post-Millennials are/were called Gen Z as well. Thanks Scott. I was surprised by the visual/chart myself. I feel it overstates the decline, but the data/population forecast is what it is. Unfortunately, even as we are generally seeing longer life expediencies over time, that’s just for the average or typical person. And, more unfortunately, we’ve seen life expectancy stagnate or fall some in the past 15-20 years due to drug overdoses, alcoholism, suicides, obesity and the like pushing back on the continued medical advancements and falling lung disease rates and the like. Good article – thank you. I would slightly disagree with one point, however. The research I’ve read and my observations show that Gen Z was indeed affected by the Great Recession more than you indicate. These children were affected by changes in family dynamics/structure and living conditions, especially among working class families. Frequently, dad was laid off, mom went back to work at a lower paying (retail or service) job, changing the way the way households were run. Living situations changed as families moved in with relatives, or lost houses and moved into multi-family housing. From what I’ve read, this has made Gen Z more practical and financially-aware than Millennials. Market research firms focus on generational differences to understand purchasing habits, so a lot of research exists on the subject. Thanks Maggie! I agree. The Great Recession scarred Millennials professional careers as they were launching, but it scarred Post-Millennials family life, if we’re painting with very broad brushes. If I read correctly this is more about migration than anything else and I wonder where that migration is coming from. I can see the cyclical nature of this type of research and wonder if the pendulum will swing back toward those losing residents in the next few decades.